Within a few working days, every death has to be registered in the municipality it occurs. This means there can be a difference of a few days between the document date and the actual death date. Many deaths are registered by close family members or neighbors. Two male witnesses are required at the registration. These are often neighbors, although sometimes family members can be seen as well. Sometimes a death took place in a different place than where the person lived. Such deaths are often registered in the place of residence as well. An abstract of the official death certificate is then copied into the death register of the place of residence. Stillborn children are registered in the death records. They are usually called "levenloos kind" (lifeless child), "levenloze dochter" (lifeless daughter) or "levenloze zoon" (lifeless son). Death records are public after 50 years. Death records can be found at both the provincial archives and local archives. Many death records are available online in the website WieWasWie. I am coming to Amsterdam for 3 days . My grandfather died in amsterdam during the was. We were told he starved to death, but had money on him, also had owned property, he traveled from USA often so we know he was not poor. I AM TRYING TO FIND HIS DEATH RECORD. I Have his birth certificate his parents and the death certificates of his grandparents.. Can you kead me in right direction. I only have old address and names. No knowledge of date of death, might be able to find approx date of birth. I do know my great greats lived and died AT 51 Amstel, have read a lot on the building and look forward to seeing the museum. Thank you in advance for any help you can give me his name ……?………… Philippus Cornelis Mell. 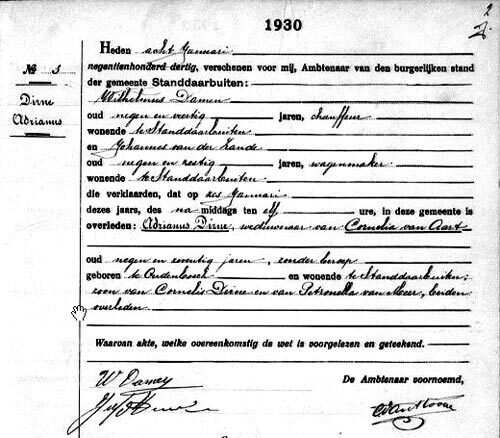 Born 1860 married Anna Maria Fontjin Beek Aug 25 1885. Brother Johannes Mell 23 blacksmith was present..he married 3 more times all wives died. I am trying to find out about my grandmother’ sister. She was Alida Obbema and was born in Workum in 1896. The family moved to Germany in 1899 and lived in Vernich, near Weilerwist. Both my great grandparents died within two weeks of each other in 1907 in a hospital in Heimerzheim. I have death notices for both of them. The children, three of the four girls, of which my grandmother was the youngest, were eventually brought back to the Netherlands. However, there is no trace of Alida. We assume that she died in Germany, but can’t find any death notice or information. I guess, we’ll never find out, but would appreciate any suggestions. Have you done research in Vernich and Heimerzheim to see if she appears in death records there? These are probably not online but would require on-site research. Yes, I have. I got two death certificates for my great grandparents. She doesn’t seem to be there. e don’t even know if she died in the Netherlands or in Germany. I can’t find anything in the church records in Friesland. I guess, it will remain a mystery. wonder if you could help.